Not a huge 1911 fan but I do like quality guns. There is a Ed Brown 1911 Kobra Carry at the LGS for $1300. Seems like a discount entry to the custom 1911. What say you? Are pistols from Ed Brown, Wilson Combat, Les Baer, etc really worth the price? 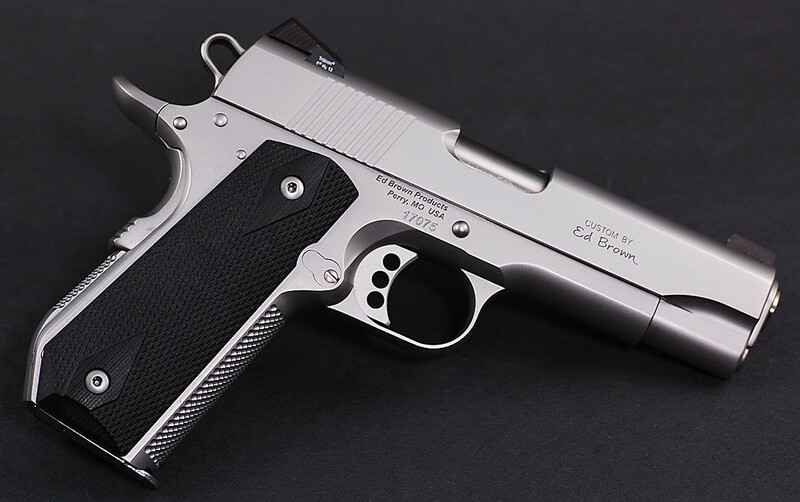 Are 1911 custom pistol from Ed Brown, Wilson Combat, and Les Baer worth the price tag? Hell yeah. You get what you pay for. Depends on what you want or need it for. First that has to be used. That is cheap for a Brown. Second if you want a “weapon” hell no they are not worth it. They are fantastic guns and would make fine “weapons” but the reality is you can get equal or better performance from a $500 pistol (not a 1911). In my opinion you buy these for their craftsmanship and pride of ownership and the sheer way all of the parts work in perfect harmony. I have a Brown 1911 Kobra full size and it is AMAZING!!! It is not however my nightstand gun. I like it for for so many different reasons. I've got one Brown and three Wilsons, they're very, very nice guns that I like very much. A BMW and a Ford Focus will both take you where you want to go but a BMW sure is nice in comparison. Yes, sorry to mention that it was a used pistol. Browns and Wilson’s are works of art! I have several of each, and they are not recent acquisitions. No I don’t frequently use them as I used to since I have favored more resent cheaper models, but I don’t “baby” them more than I do the others and they are as good and as accurate as the day I first broke them-in. After all, they are ment to be used and abused if necessary. They do survive with all their character and beauty! I am not a huge 1911 fan either. I bought an Ed Brown Special Forces Carry in 45 ACP. I liked it so much that I then bought a pre-owned Ed Brown in 9mm. If the condition is anything but trashed, the $1300 price is a steal. You have my approval to proceed. Too good to be true at that price, even used. Could be that the owner is trying to dump a problem gun. I went and inspected it more closely. Earlier gun. 4 digit serial number. 3xxx. No safe queen. Barrel not beveled. Nightsights pretty much dead. Some minor carry wear. Looked carried more than shot. Mag actaually looked new. I am torn. I might generally agree with that assessment, but not for the "boutique" 1911 manufacturers. Ed Brown, Wilson, and Nighthawk have customer service that most companies can only dream of. Problems, even with used guns, are treated as if the owner was a VIP. I do not own a Brown, I have only Nighthawks and Wilsons at this time, but I have 2 associates that have Ed Browns, one of whom had a problem, and Ed Brown took care of it in days, all on their dime, and the gun was a couple of months old at the time. You can't go wrong for $1300 for that Ed Brown. Brand new they list for ~$3k. I have the same pistol and they shoot like a dream. At $1,300 I'm shocked it's still available. Unless it was abused, flood/fire damaged or missing it's original parts, it is easily worth twice the asking price. Are Ed Brown pistols worth the money? Well, they sell every pistol the build. However, since you're admittedly not a 1911 fan, is it really a bargain? Daddy once told me, "Never buy anything you don't want just because it's cheap". Of course, if you'd like to test the 1911 waters, the Kobra is a great place to begin. Seriously, if you choose not to buy it please email me the shops info. I'm willing to take a gamble on a brown for 1300 sight unseen. Thats an excellent deal. I don’t think I would be able to pass up an Ed Brown Kobra Carry even if I weren’t into 1911 pistols and I wouldn’t hesitate to carry it on special occasions (family get-together, holidays, etc.). If that were at my FFL at that price I’d be all over it without a second thought. $1300 is an incredible price for an Ed Brown Kobra Carry. They usually sell for $3k. You could probably resell it for around $1900 if it's fairly clean. The Kobra is anything but a discounted entry into the custom 1911 market. I have a 5" s/s Ed Brown, a 5" Wilson Combat, and a handful of Colts, a S+W 1911, etc. The Ed Brown is by far my favorite. The fit and finish, attention to detail, the way it shoots, the way it recoils, the accuracy, the trigger.....I like it far better than my Wilson Combat. Edited to add. It's still a steal at that price. I bought mine new in 2012 and it's a 4 digit serial number of 79XX. So the gun is not that old, and even if it was, aside from the night sites, nothing else on the gun is different. Is the finish s/s or the black finish they use? I'm still of the opinion that this gun more than likely is a problem gun. 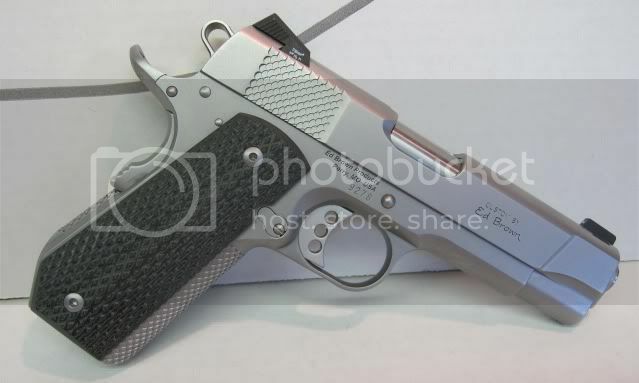 The LGS guy is not so stupid that he doesn't know what a Brown 1911 is to price it that cheap, even a used Kobra. J, you should buy it and prove me wrong. Problem gun or not, it's still a bargain. Certainly it can be sent back to Brown to alleviate any less serious problem(s) that might exist....exceptions being a cracked frame or slide.